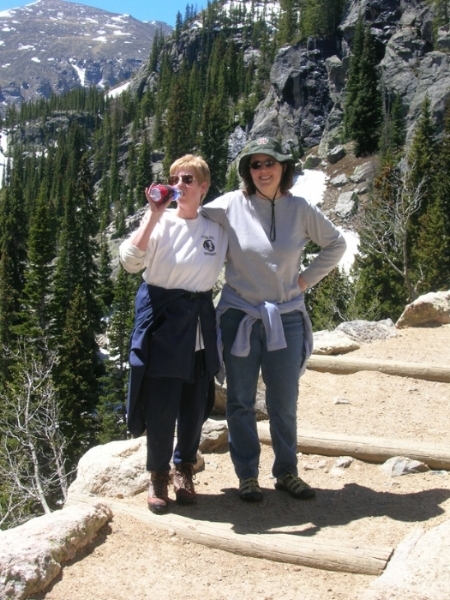 When we hiked in the Rocky Mountain National Park, we carried plenty of water. Thinner air at high elevations increases water evaporation from your lungs. You may not feel thirsty, but you should drink a lot of water which may prevent a bad headache or other high altitude symptoms. Thinsulate insulate Kup Kollar on the water bottle to hold in the cold. I froze a bottle half full of water. When I removed the bottle from the freezer, I added water and a Kup Kollar (bottle wrap) to keep the water colder, longer! Part of the trail went through large boulders. Sean and Perry walked carefully so they wouldn’t slip. I’m not sure what to call this body of water. It’s a temporary small pond caused by melting snow. I didn’t walk out to the edge of the snow to take the photo because I didn’t want any wet surprises!